Find My Workspace lists over 95% of the business centres market in Purley. Simply click Request Quote to check pricing for one office, or Add to Basket for multiple offices. 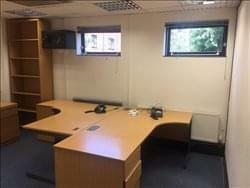 High quality offices in a range of sizes are available at this fantastic Purley address. The workspaces range from 2 desks up to 10, great for businesses of all types. The centre offers a turnkey solution where companies can move straight in with all utilities or companies can choose which services are required. The property is secured with 24-hour CCTV as well as fire and intruder alarms. Tenants can benefit from 24-hour access to the property and take advantage of the on-site facilities that include communal kitchen areas. Rent is fully inclusive of gas, electricity and business rates, with the opportunity to include all relevant services such as secure parking, cleaning and IT infrastructure. To obtain information for your selected Purley Business Centres, please tick the "Add to basket" box for each office you prefer and complete the form below. We will then send a detailed report via email.